To those wanting to pursue fishing pro staff positions, whether professional or promotional, the chances are pretty good you may be asked for a fishing resume at some point. When the time comes, it will pay dividends to know a few things. A fishing resume is different to almost every company. Some use it as a weeding out tool. The fact of the matter is, anytime I’ve asked someone for one, only about half the time will I ever see it. If you aren’t willing to put in the time to do a “one sheet” you won’t put in the time I’m expecting to promote my company. Another thing it allows me to do is see if you can communicate. I’ll most likely talk to you on the phone, email back and forth and see what a polished product looks like from you before the resume process is concluded. If you don’t use spell check or construct sentences well, that might point to issues in helping sales. At a minimum, our conversation needs to go well. Anglers often confuse a fishing resume with a job application. While listing accomplishments is important, I want to know how you are going to leverage your networks to help my product gain more market presence, sales, etc. If you have a YouTube channel, tell me about how you could make a video feature and include a link to an example. If you are a writer, link your blog and some other well known publications you’ve been published by. Spend more time talking about the future than the past. In talking about the future, under promise and over deliver, not the other way around. If you tell me how you can make an hour long video featuring my newest bait, shot underwater while fish attack it, and get one million views, you better deliver. Numbers and promises are typically something to avoid when forecasting. Setting goals is fine. Don’t promise. Keep your resume as close to one page as possible. Nobody has time for a seven page resume, especially if six pages of it are all the companies that you pro staff for. While that’s great for you, it means your time is divided and my product may not get the attention I’d like. When listing other affiliations, list the big ones if there are several. Three or four is plenty and for some companies might be too many. Your time and endorsement/promotion has to be worth it. If you have your resume typed up, proofread and ready to go, have a few friends look it over. I don’t mean your beer buddies. Look to guys who do a lot of writing, guys who do quite a bit of promotional work in the fishing industry or even an English teacher. Allow them to ask questions. Take criticism and make changes as needed. Does it all fit on one sheet? If not, maybe edit it down a bit. It’s not a hard and fast rule but it will help. You may never need a fishing resume but if you do, at least you’re a little more prepared. What types of info would you suggest for the first timer who has a desire to become a pro-staff member, who is passionate about the product and the sport, but doesn't have any "accomplishment s" yet, without being the "spammer" on social media you mentioned in a previous blog posting? What types of info would you suggest for the first timer who has a desire to become a pro-staff member, who is passionate about the product and the sport, but doesn't have any "accomplishments" yet, without being the "spammer" on social media you mentioned in a previous blog posting? You can always write an article and submit it to be published on here! http://www.yakangler.com/submit-content If you article gets chosen for publication you could use that on your resume. I did post one article a couple months ago about my first outing on a kayak, but haven't heard anything back. I'll get to work on some reviews. I would suggest using what you have confidence in, build a platform (either Blogging or Videos) and beef up the resume. Fish some tournaments or do reviews on products. Talk about your adventures and make a name for yourself. If your content is good, people will come and read/view it. Not everything you produce will be a hit. Consistency is a BIG thing. Build the audience the right way. Promoting and spamming are two different things. Be selective where you promote. Small bait companies are usually the best place to start. Also, ask what your motivation is. Is it pride, passion, price or something else? You will more than pay for any discount you get. Trust me. You have to be willing to do it for free and many do before anything comes their way. Thanks for the advice Chris. 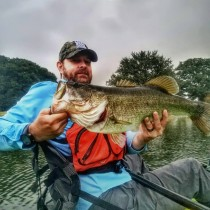 As my response to YakSushi may suggest, I'm fairly new to kayak fishing, with limited experience in the equipment related to kayaks, but baits are something I have a bit more knowledge about since I've been fishing all my life. For me I think it would be great to be recognized for any work that I may put in for a specific product, and the enjoyment and relaxation that I receive from just fishing in general.